Even though North Carolina’s uninsured rate has fallen to 11.6 percent as a result of President Obama’s Affordable Care Act, the state still gets an average-to-failing grade (a D+) when it comes to women’s reproductive rights and overall health and well-being. And while there are obviously lots of factors that contribute to this poor grade, one of the most obvious is the failure to expand Medicaid under he ACA. As with other southern states, the shortsighted decision of North Carolina lawmakers to block the full implementation of the ACA so that more women can gain access to the health care they need is producing large amounts of unnecessary harm and suffering for thousands upon thousands. Take Michelle for example. Medicaid expansion would allow her and thousands of women like her to finally have access to the primary and preventive care most people take for granted. 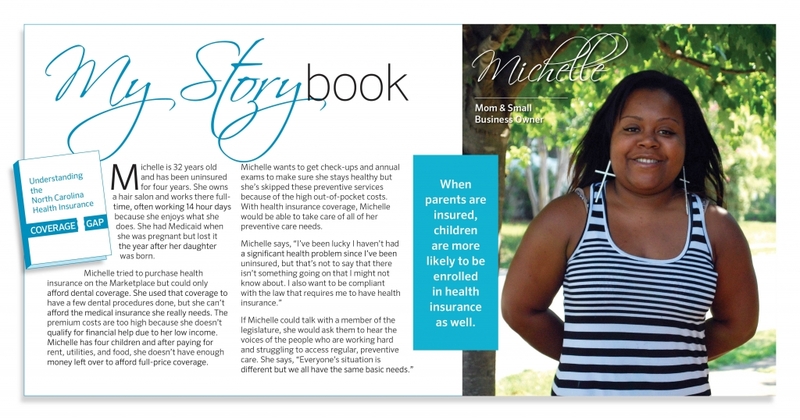 Michelle owns her own small business, a hair salon, but considering how business fluctuates, she does not earn enough to qualify for financial help to enroll in Marketplace coverage. Michelle’s eligibility status is further complicated in that even though she is a parent, she makes too much to qualify for Medicaid. Thus, Michelle and many hard working parents like her remain uninsured. In addition to worrying about receiving the primary care she needs to remain a healthy and hard working small business owner, she wants to take care of health care needs in order to be a great parent and role model for her children. Tragically and remarkably, this bad situation may soon get much worse. While the Medicaid blockade has, despite Gov. Cooper’s recent laudable efforts to overcome it, harmed hundreds of thousands of people like Michelle, the gap will almost certainly widen dramatically if Congress makes good on its threats to replace the ACA. Indeed, as Congress pursues “plans” to replace the significant coverage gains of the ACA with plans that do not account for pre-existing conditions or even making sure there is gender parity for health care, there will be be thousands more moms who are faced with impossible choices regarding their health and well-being. Happily, all hope may not yet be completely lost. As the debate over ACA repeal continues, more and more states states that have already expanded Medicaid and realized the benefits (many with conservative Republican leadership) are fighting to continue Medicaid expansion as it has benefited thousands of people and state budgets. Let’s hope the logic of this argument finally dawns of North Carolina leaders in the days and weeks ahead.